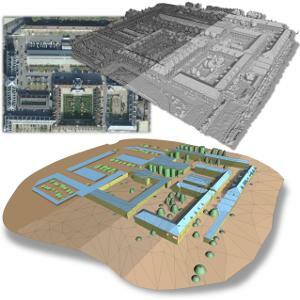 Abstract : We introduce a novel approach that reconstructs 3D urban scenes in the form of levels of detail (LODs). Starting from raw data sets such as surface meshes generated by multi-view stereo systems, our algorithm proceeds in three main steps: classification, abstraction and reconstruction. From geometric attributes and a set of semantic rules combined with a Markov random field, we classify the scene into four meaningful classes. The abstraction step detects and regularizes planar structures on buildings, fits icons on trees, roofs and facades, and performs filtering and simplification for LOD generation. The abstracted data are then provided as input to the reconstruction step which generates watertight buildings through a min-cut formula-tion on a set of 3D arrangements. Our experiments on complex buildings and large scale urban scenes show that our approach generates meaningful LODs while being robust and scalable. By combining semantic segmentation and abstraction it also outperforms general mesh approximation ap-proaches at preserving urban structures.